With the long dark evenings and the talk of the electricity company going on strike it made me think about how much we depend upon light. Without electricity Christmas would be rather dull. (Thankfully the dispute has been settled.) The light Jesus was talking about in the above verse is even more important as it is the ‘light of life’. Knowing Jesus as our Saviour brings light to our souls. He gives us guidance and direction and will one day bring us to heaven. What a joy to know the light of the world. He gives true meaning and purpose to life not only at Christmas but throughout the year. I mentioned at the beginning of my Summer News Letter that I was waiting for the weather to improve and it certainly did. I enjoyed the warmer summer weather. The American team were expecting the usual cool summer and missed their air conditioning. Our summer outreach in July went well. We had 40 children attend the Holiday Bible Club in the local Athletic club in Carlow. This was about twice the number that came last year to the church. We used Child Evangelism Fellowship materials to teach the children the Word of God. There were three special evenings based around food in the Presbyterian Church. Actually due to the good weather we sat outside and enjoyed African, Asian, European and American food. We were not sure how many would turn up for these evenings and were very encouraged when approximately 150 turned out each evening. Rev. 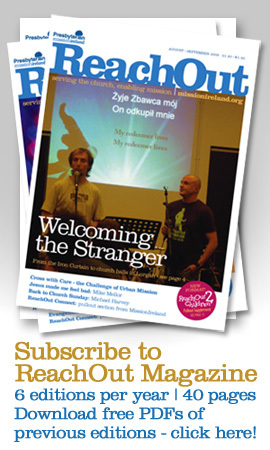 Stephen Rea spoke each evening and there were opportunities to talk to people about their relationship with the Lord. In Athy we were kept busy with 80 children at our Holiday Bible Club in the Youth Centre. The evening events were based around sports. Numbers were smaller this year and the events ran smoothly. We had an indoor bowling evening and the Arch Bowling club not only leant us their equipment but came along and showed others how to play. Each evening one of the American team shared how God had changed their life and there was also a short Bible talk. The American team joined local people from the church and community in running the summer outreach. Without all the support it would not be possible to have such events. Looking forward to working with you all next summer! During August I continued to meet with some of the local helpers and organised a trip to Oakwood theme park in Wales. The monthly Fellowship Meeting also continued over the summer months. The children’s club in Athy has started again and the children are as lively and energetic as ever. We continue to meet in the Youth Centre on Friday at 4pm. This autumn we are teaching lessons from the life of Elijah and Elisha. In Carlow we are meeting in a new venue, New Oak Community Centre, and hopefully we will be able to attract more children. There is a number of housing estates within walking distance of the centre. I am very appreciative of all who help with these clubs as without their support it would not be possible to run them. On Sunday evenings I have started a Bible study in the Youth centre in Athy. At present there are only four of us but hopefully I will be able to encourage a few more to join with us. These meetings take place on the Sunday’s we don’t have the Fellowship Meeting, which is on the First Sunday of the month. I continue to have a bookstall in the open air market on Tuesday’s. I get opportunities to meet and talk with people about the Lord Jesus even though I don’t sell a lot of books. On Wednesday evenings I meet with young adults most of whom have come to the children’s meetings and youth club and continue to help in the summer outreach. It is good that they still want to meet together and I usually have a short word for the evening from the Bible. The rest of my time is taken up with visitation, preparation for meetings, speaking at an occasional church service, helping with a local youth club and the indoor short mat bowling league, which I take part in, has just begun its new season. It is good to be busy and involved in the local community. I am working with David Bennett of the Faith Mission in organising a praise evening in the Community Arts Centre in Athy on Saturday 19 October. This is a one off event but if it goes well we may organise similar events. If any praise groups or choirs would be interested in leading praise evenings in Athy get in touch with me. I find it rather surprising that people are already shopping for Christmas but it is always good to plan ahead. Our Carol Service is always a special event when children from the children’s club take part. I also distribute free gospel calendars in Athy during December which many people appreciate and some even ask for a second calendar to pass on to a friend or relative. There is much to give thanks to God for over the summer and much to pray for. Please continue to pray for the work and people of Athy and Carlow. Hi, thanks for all your continuing support in prayer. Well, we have well and truly settled into our new home next door to Ulsterville Church. I don't think there is a single person who doesn't think this is a fantastic venue for our outreach. It's much larger, far more spacious and modern. Yesterday was a great day in the drop-in, let me share some of the reasons why I thought it was. It is good to know that God has a plan for our life and those plans are for our good. Jeremiah wrote to those who had been carried off into exile by Nebuchadnezzar, King of Babylon, to encourage them as they were going through tough times. Many today in Ireland are going through tough times, financially and spiritually, many have had to leave home to get work, many see no point of believing in God. We need to take Jeremiah’s message to heart and to trust in our Lord Jesus whom God sent to save us from our sin and give us hope for the future. Pray that the people of Ireland, and especially those in Athy and Carlow, will call out to God for salvation. Plans for Summer Outreach. We plan to have a team from Birmingham, Alabama arriving on 29 June until 15 July. They will be working with people from Athy and Carlow. Pray for recruitment and preparation for the team. From 2 -6 July we will be working in Carlow, giving out invitations and talking to people on the streets. Then in the afternoon we will run a Holiday Bible Club for children, using Child Evangelism Fellowship material. In the evenings we are running a Christianity Explored course. We are going to run this every evening for a week rather than over a seven week period. Pray that people from the local community will attend and come to know Jesus. From 9 to 13 July the American team will be helping with outreach in Athy, a Holiday Bible club for children in the afternoon and outreach to teenagers in the evening which will involve games as well as a Bible message. The outreach in Athy continues from 16 until 20 July. The American’s will have gone home so we are looking for helpers to join with us for this week. It will be a follow on from the previous week with a Holiday Bible Club for children and activities for teenagers. If you would like to join with us contact me. Contact details are at the top of the page. Pray for the all the organising, publicity, safety, helpers, both visiting and local, and for all the people we will be in contact with. May we see people coming to a saving knowledge of our Lord Jesus Christ. Praise God for the Word of God that has been sown and the contacts and relationships over the past months. Tuesday in Athy Market. The warmer weather has made having the bookstall in Athy market much more pleasant. There is still not much interest in Christian books but pray for the contacts made. Pray for the Jehovah Witnesses, who also have a stall in the market, that people will not be deceived by their false teaching. Wednesday night youth club. We had a group of young people come into the club at beginning of January. They were interested in playing soccer so we added soccer to our activities as well as group games, pool and table tennis. Each week we had a short Bible message. They continued to attend until after Easter but then their attendance became irregular due to other commitments. The leaders continued to meet until the end of May. We look forward to the challenge of working with them during the summer. Tuesday evening Bible Study. We began after Christmas with Biblicia’s Community Bible Experience, which involved reading the New Testament Bible over 8 weeks and meeting weekly to discuss what we had been reading. Eight people began this course, although not all were able to complete it due to illness, but all found it beneficial. After Easter we began studying the book of Galatians and that is continuing. Since January there was both an Alpha Course and an Exploring Christianity Bible study running at the same time in a cafe in Athy. I was involved in the Exploring Christianity Bible Study. The Alpha course finished at Easter but we continued on with Exploring Christianity until the end of May. Pray for all who were involved in these meetings and for the future. Friday children’s meeting. We have been studying the Life of Christ up until the end of May when we finished off with a trip to the local forest and a picnic. Some of the children were asking why we could not continue and have booked in for the summer outreach but I think the leaders need a break to prepare for the summer. It is encouraging to hear the children asking to continue meeting. Community involvement. I help out at the local Youth Centre on a Friday night and in running a local community hall. This is a good means of getting to know people and keeping in touch with what is happening in the community. Thank you for your ongoing prayer support. Gareth Parker is the latest addition of community evangelists funded by the BMI Irish Mission Fund. Hi everyone, this is the new facebook page I’m going to use as a window for people to have a peek inside and see what we are about. http://www.facebook.com/meeting.point139 The 139 was necessary as facebook had already allocated the meeting point as an address. It's both our number on the Lisburn Road and a very apt Psalm for what we do.